Visions of times past. 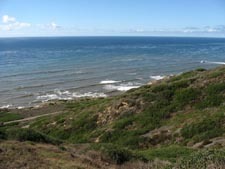 As you are driving to the Cabrillo Monument, conjure-up images of what the views would have been like back in 1542 when Europeans first landed in San Diego. 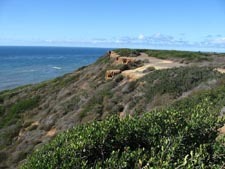 An unspoiled land that had been inhabited by the prehistoric Kumeyaay Indians for about 10,000 years. The views are different today but still are spectacular. 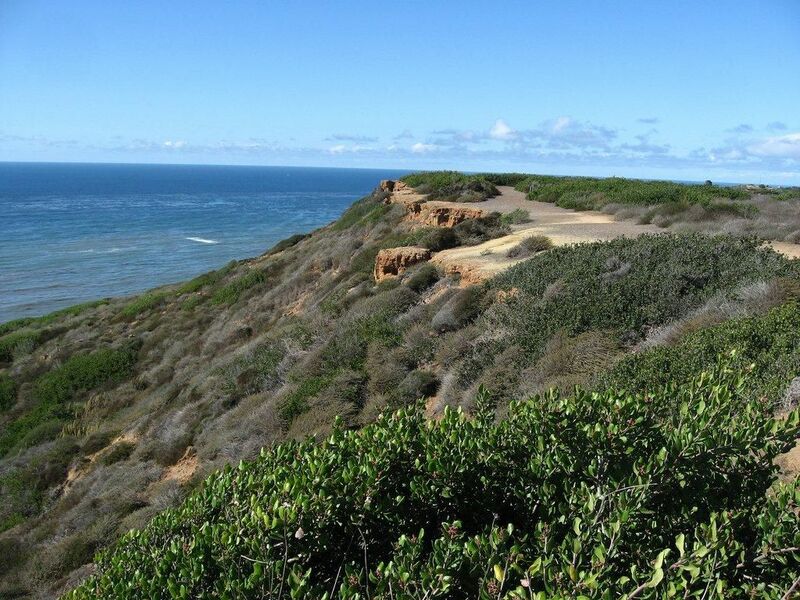 Those that visit will be rewarded with breathtaking scenes in all directions from the Cabrillo National Monument at Point Loma Peninsula. 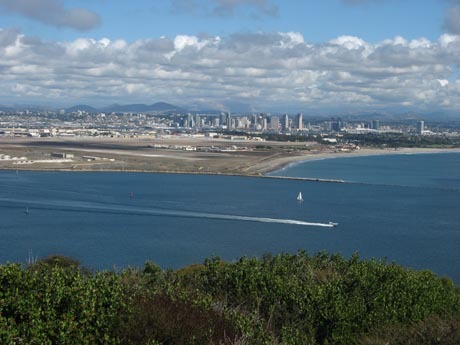 From the hilltop, gaze across San Diego Bay to the San Diego Skyline and the Coronado Bridge. Look west at the never-ending horizons across the Pacific Ocean. And at certain times of the year, you might catch glimpses of migrating gray whales. On a clear day, you can see the beginning coastline of Baja California Mexico. 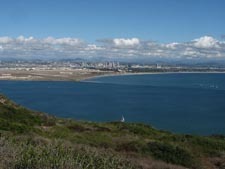 The Cabrillo National Monument was created in 1913. 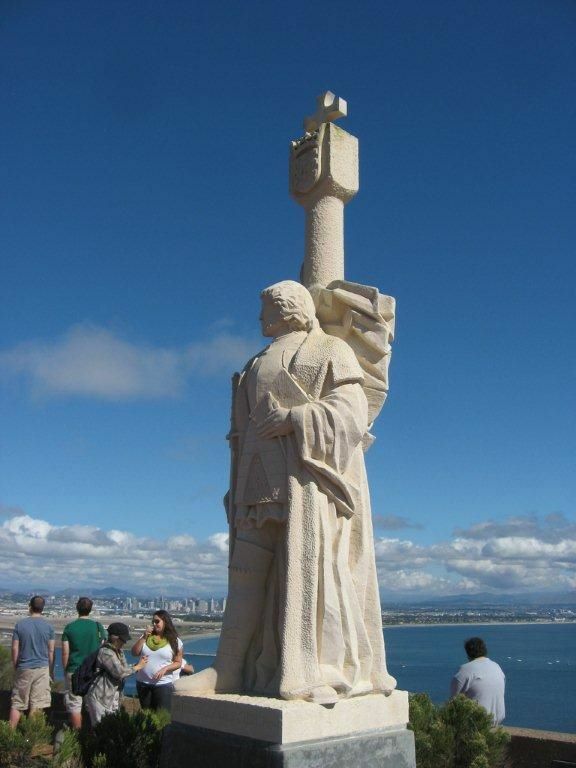 It commemorates the place that Juan Rodriquez Cabrillo and his crew landed on Point Loma in 1542. Cabrillo led the first European expedition to explore what is now the west coast of the United States. 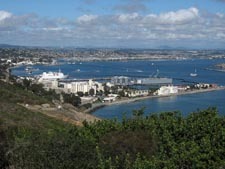 He did not get credit for discovering "San Diego" since the expedition left proceeding north along the coast without creating a permanent settlement. 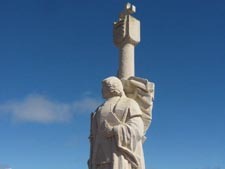 Credit for the discovery of San Diego is given to Father Junipero Serra who built the first mission in 1769 several miles inland at the present day site of Old Town San Diego. of three ships set sail from the port of Navidad, Mexico (New Spain) with a crew of sailors, soldiers, merchants, livestock, a priest and provisions that intended to last for two years. He also had Native Indian and Black Slaves. The expedition was to explore the coast hoping to find a route connection from the North Pacific Ocean to the North Atlantic. He was also hoping for the discovery of the Seven Cities of Gold known as Cibola. Cabrillo landed near the present day location of Cabrillo National Monument. The three ships anchored on the east side of Point Loma in 1542 about a hundred days after departure from Mexico. Cabrillo named the area "San Miguel" but that name was changed to "San Diego" sixty-years later by another explorer, Sebastian Vizcaino. 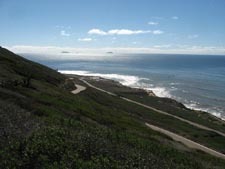 Not too long after arriving, the Cabrillo expedition continued proceeding north. 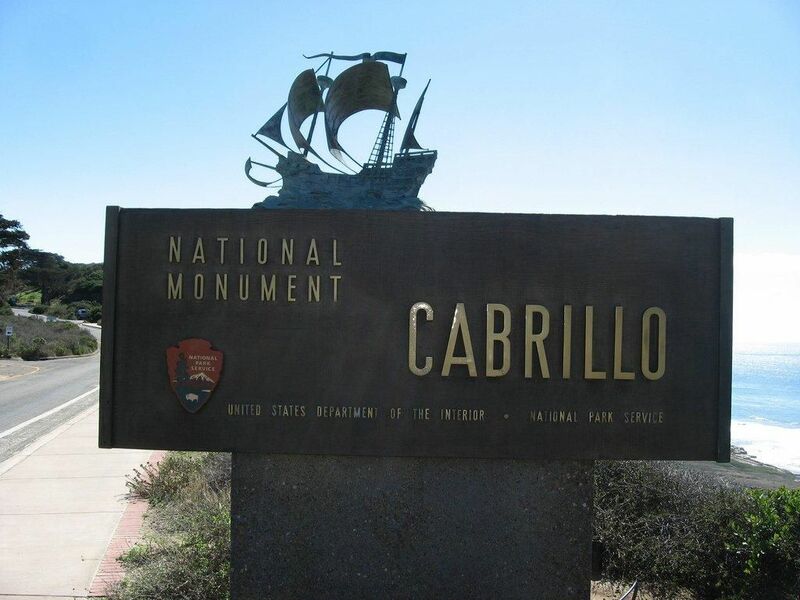 During that northern exploration, Cabrillo died and under a new command, the ships are thought to have gotten as far north as Oregon, before rough winter storms forced them to return back to Mexico. 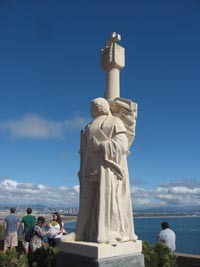 Today, a tall statue of Juan Cabrillo stands overlooking San Diego Bay which is the landmark icon of Cabrillo National Monument, a national park. A model of Cabrillo's flagship, the San Salvador, is on display inside the Age of Exploration Exhibit Room near the Visitor Center which presents the film "In Search of Cabrillo." An exhibit hall depicts the life and times of Juan Rodriquez Cabrillo. 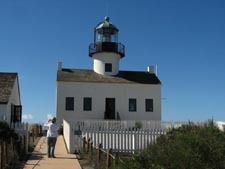 Ranger-led programs about Cabrillo are usually available on weekends and on many weekdays during summer months. 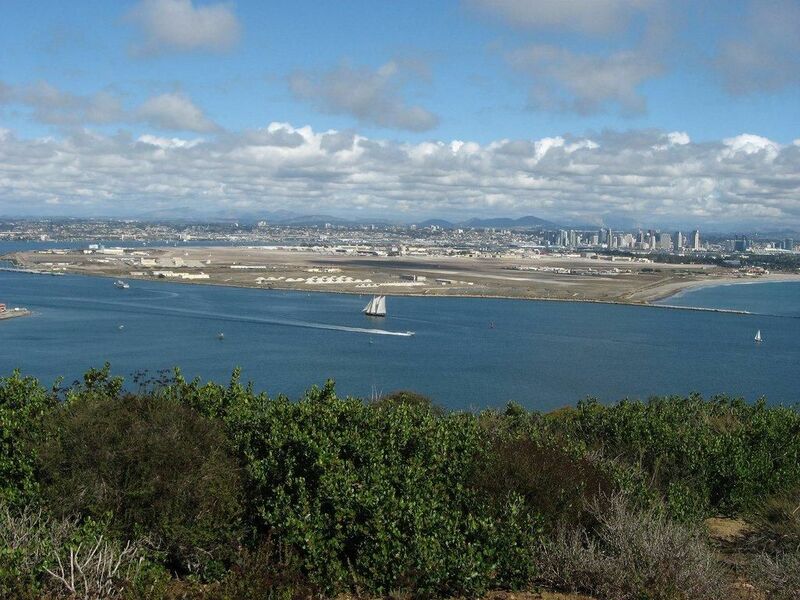 The views from the monument are reason enough to visit Cabrillo. But there is plenty of other things to enjoy. 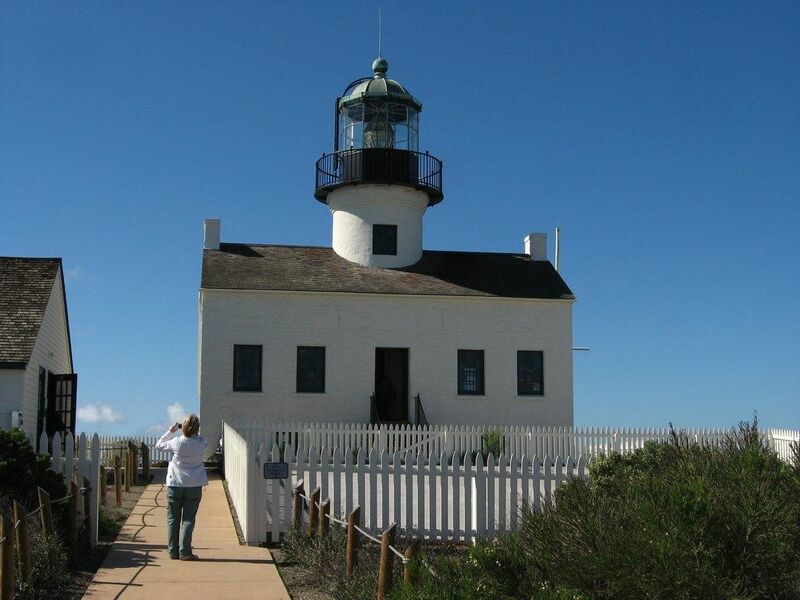 Start at the park's Visitor Center where the "Age of Exploration" exhibit, films and guided-programs delve into the history of Cabrillo. Explore the Old Point Loma Lighthouse which has been restored to its original 1880s appearance. 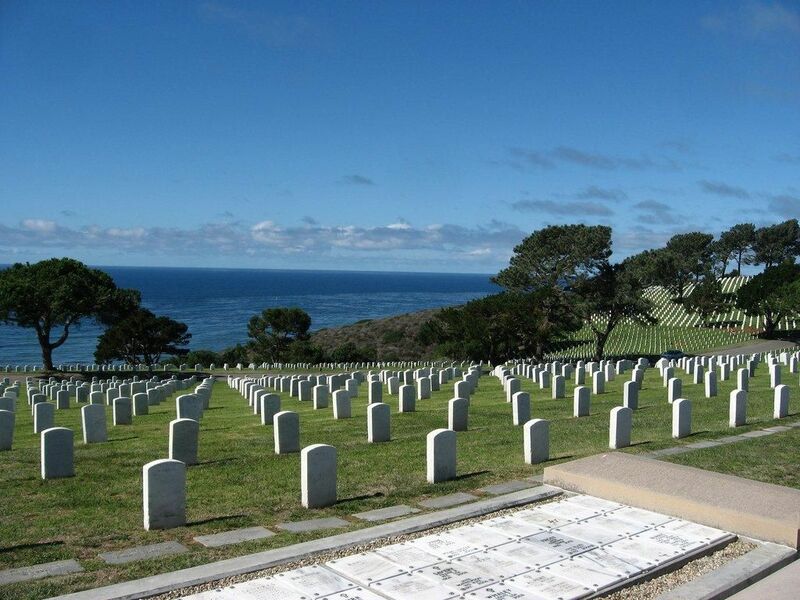 San Diego has a long and rich military history. 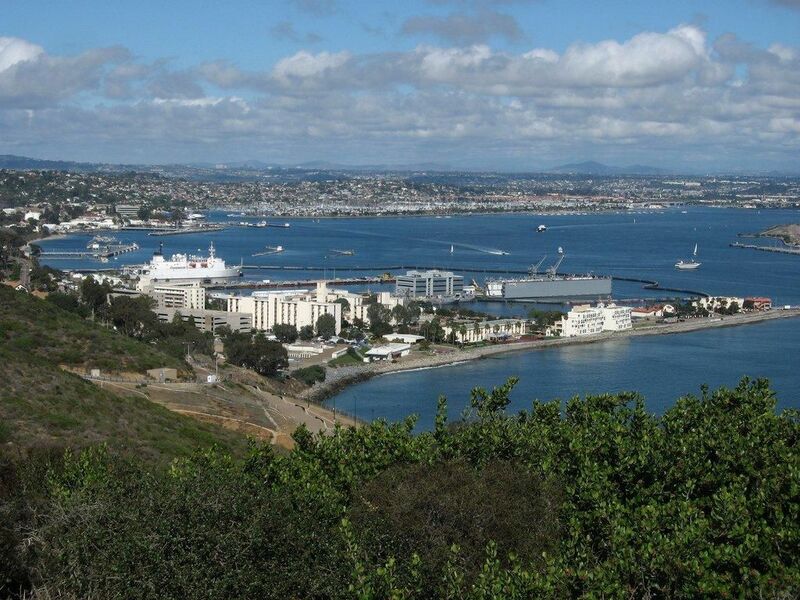 Because Point Loma forms a natural protective barrier to San Diego Bay, it played a pivotal role in defending the city. Much of the defense systems built here during World War II still remain. You’ll find numerous bunkers and various military stations here. 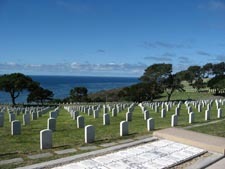 Be sure to visit the Historic Military Building where the "They Stood Watch Exhibit" shows you the military history of Fort Rosecrans. 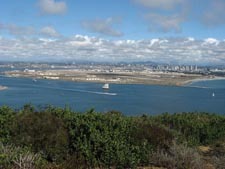 The Bayside Trail near the lighthouse runs through coastal sage scrub and offers fantastic views of San Diego Bay and the city skyline. Hiking the Bayside Trail takes you through unique and beautiful habitat. This is a two mile, self-guided walk. If you are a bird-watching enthusiast, there are over 200 species of birds that can be seen in and around the area. 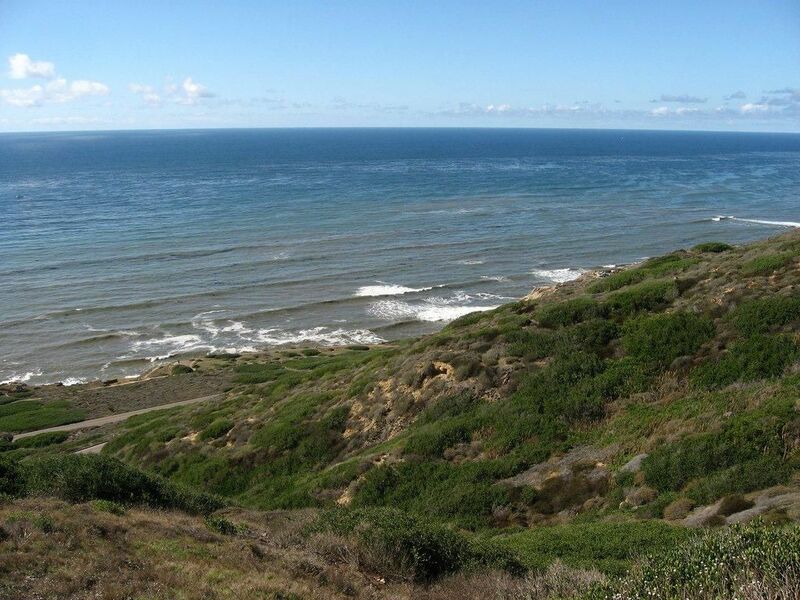 The winter months is when the gray whales migrate in the ocean waters near the Point Loma shore. There is a Whale Overlook just south of the lighthouse. Or you can explore the Tide Pools on the west side of the park. When low tide comes and the sea recedes, it will reveal reveals starfish, sea urchins, crabs, mussels, anemones and other tide pool creatures. For tide updates, call the park at 619-557-5450. 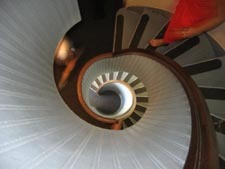 Our thanks to Ken Lund for permitting the use of his photos for your enjoyment. The pictures are licensed under Creative Commons. Click photos for enlarged views. From Downtown San Diego including the Gaslamp. Take Harbor Drive north past the airport. Turn left onto Rosecrans Street. Turn right onto Canon Street. Turn left onto Catalina Boulevard (Cabrillo Memorial Drive). Follow Catalina to its end. From Interstate 5 Northbound. Exit at Hawthorne/Airport. Follow the road to the left under the freeway towards the bay. Turn right onto Harbor Drive. Take Harbor Drive past the airport. Turn left on Rosecrans. Turn right onto Canon Street. Turn left onto Catalina Boulevard (Cabrillo Memorial Drive). Continue on Catalina until it ends. From Interstate 5 Southbound. Exit at Rosecrans/Highway 209. Continue on Rosecrans into Point Loma. Turn right onto Canon Street. Turn left onto Catalina Boulevard (Cabrillo Memorial Drive). Continue on Catalina until it ends. From Interstate 8 Westbound. Exit at Rosecrans/Highway 209. Continue on Rosecrans Street into Point Loma. Turn right onto Canon Street. Turn left onto Catalina Boulevard (Cabrillo Memorial Drive. Continue on Catalina until it ends. Public Transportation. 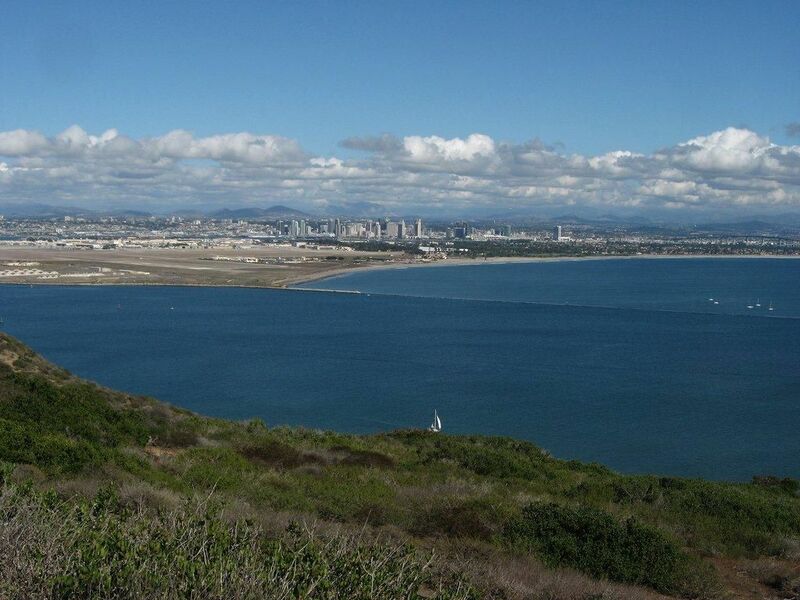 The San Diego Metropolitan Transit System provides hourly stops at the Cabrillo National Monument Visitor Center. See its website for schedules and route numbers.